Is this the Honda we've been waiting for? Prior to the 2010 Honda, the format changed. Instead of two representatives from each HBCU conference (and two independents) Honda went to a format not too dissimilar from the BCS: Autobids for each conference (and an independent), and at-large opportunities beyond that. 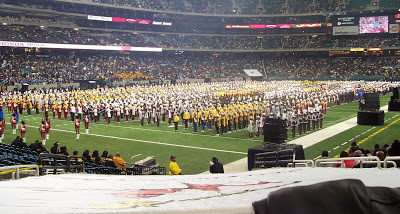 They also trimmed the field to eight bands from ten. Conventional wisdom was that the Division I conferences, the MEAC and the SWAC, would gobble up all of the at-large slots, but that was never realized. In no year did either conference net more than two participants; the field each year looked a good deal more balanced than I would have expected, with only the SIAC ever putting three (conveniently close to/in Atlanta) participants in the field. This year's battle is heavy on the heavies, with both the MEAC and SWAC bringing three bands to the Dome. The SIAC and CIAA each get just one in, and there is no independent representation. Even the CIAA's representative, Winston Salem State, was in the MEAC just a few short seasons ago, while the SIAC is represented by hometown Morehouse. With all due respect to the smaller conference bands, this year's event seems tailor-made to put butts in seats of an already beloved program.